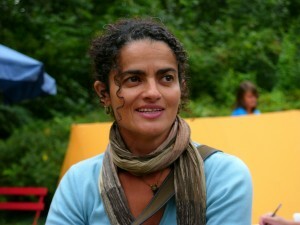 Vivianne Rodrigues de Brito – Guild Certified Feldenkrais Practitioner, Contemporary Dance Teacher and Classic Masseuse. I have been involved with movement research and dance for about 30 years. After an international career in modern dance and several years of teaching I was faced with a severe neck injury. Uncertain whether I could ever teach again I turned to the Feldenkrais Method. Fascinated by the effectiveness of the method in my own recovery, I decided to train for 4 years at the Feldenkrais International Training Centre in England where I studied under practitioners who have worked directly with Moshe Feldenkrais. It has been my great pleasure to introduce Feldenkrais lessons into the program of the Modern Dance Department of the Amsterdam Hogeschool voor de Kunsten, where I have been teaching Contact Improvisation and Floor work since 2002. Feldenkrais has been changing the way I perceive myself and the way I relate to my body, to my mind and to the environment around me. I am deeply moved and grateful for the outcomes of this method and I want to give other people the chance to experience the very same.